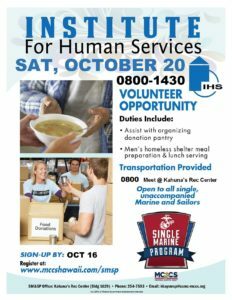 SM&SP Volunteer Opportunity at the Institute for Human Services. Volunteer at the men’s homeless shelter. Assist with organizing donation pantry and meal preparation. Transportation provided. Meet at Kahuna’s Rec Center at 0800. Visit www.mccshawaii.com/smsp to register.